The DSM 5 describes an Anxiety Disorder as "features of excessive fear and related behavioral [changes]." Anxiety has been described as a feeling of worry, nervousness, or distress. These anxious feeling can been triggered by feeling uncertain about an outcome or an upcoming event. We know anxiety can be related to a number of different things. Some people experience feeling anxious in specific situations. Others can excessively worry almost all day over almost anything. Are you one of these people? Cognitive Behavior Therapy (CBT) is a scientifically tested form of psychotherapy that has proven to be effective for a variety of conditions including anxiety and depression. In CBT, the therapist and the patient work collaboratively to identify and address the presenting issues. Therapists support the patients and help them face their obstacles and successfully get past their challenges by changing any faulty thinking, emotional reactivity, and maladaptive behaviors. Words, numbers, images, and sounds, can all be thoughts. Thoughts are involuntary. They can be distorted, intrusive and distracting. We do not control our thoughts. They come and go without rhyme or reason. Thoughts are automatic and can impact the perspective we take and the way we feel about a formative situation. Emotions follow the thoughts we generate in our minds. Think about a sunset. What emotions do you feel? Emotions can be positive or negative and tend to motivate the types of actions and outcomes we choose to engage in. Actions are the physical manifestation of the choices we make in life. Our behaviors are the only thing we can control. 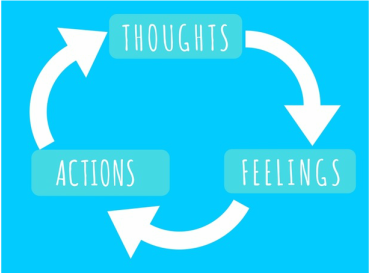 So, if positive thoughts leads to positive emotions, and that leads to positive behaviors what does the cycle look like if we have a negative thought? If we think something does it come true OR does the thought only come true after we act on it? How Can it Help My Anxiety?